SNOW KOTE | Pro Chem, Inc. SNOW KOTE deposits a thin, slippery layer of silicone that reduces friction on plow blades, shovels and truck beds to help them work more efficiency. Snow slides off treated surfaces easier and faster, allowing more snow to be moved with less fuel and less wear on equipment. It also protects metal surfaces from rust and corrosion both in use and in storage. The coating will not wash off after use or washing. Apply coating to plow blades and other exposed metal and painted surfaces by spraying, brushing or rolling. For maximum protection, apply coating at the end of each work period. Several applications over the summer storage periods will preserve equipment. 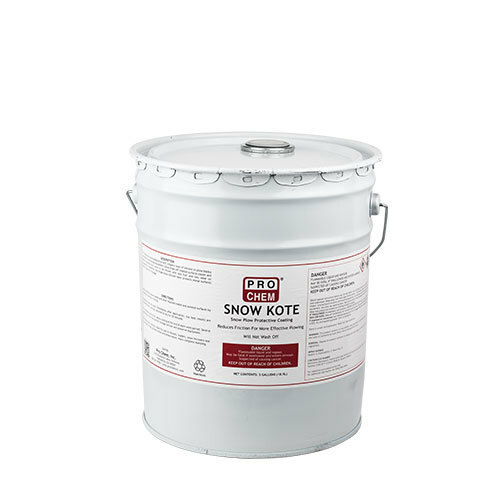 This snow plow coating is deal for use on shovels, loaders, snow throwers and truck beds to help protect metal and allow easier, more complete dumping.